I need a donor watch for parts, the seller is in the UK and does not take paypal from Canada. Total cost about $20-30. Sale ends in 3 days, help please. It is a junk watch that has a donor movement for one of my other watches. What watch is is it? I would buy it for you and send it?, problem is I´m out of cash until monday and then it´s to late isn´t it? Ps whats SWO, I thought it was Swe before? looking for a gold min hand for a wolna. can anyone help. I have one. As for me I looking for a good dial for Wolna(Volna) or for Vostok Precision. I am looking for the ORIGINAL SOVIET STURMANSKIE POLJOT 3133 STEEL BRACELET. Just the bracelet, not the watch. I am referring to the original bracelet the Airforce Sturman watch was issued with, not modern ones. There was only one type. Cyrillic marked with POLET on the clasp and inside with Nerzhabeushaya Stal (Stainless steel). I can pay with Paypal. Would need to see a photograph. Please send me a private message or email if you wish to part with one. Last edited by OKEAH; December 13th, 2006 at 22:21.
stops when right side up. Jewel and clip are obviously missing. set the day or date. If not available to buy, perhaps somebody could PM me a picture of the stem I need? Poljot 2415 (I think. Numbers were obscurred by balance wheel but 24 matches movement diameter) - this is supposed to be a 23 Jewel automatic but the automatic part is missing! It currently runs as a manual wind. Parts or replacement movement (with or without dial) desired. 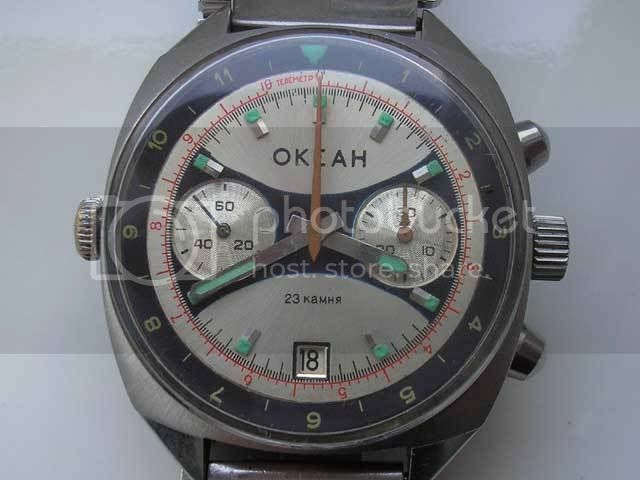 Hello does anyone have a stainless Steel bezel crown for my newly acquired vintage Okeah? I would like to replace the worn brass one when I get it serviced. I am looking for a source for Poljot parts. I am in need of an operating lever for a caliber 3133 chronograph. I have tried the same part from a Valjoux 7734, but it is not quite right. Any suggestions would be most appreciated. Does anyone know where I could get black with white lume hands for an Aviator 24hr as pictured below? I received the watch with incorrect hands.